Award-winning winemaker David Specter. Photo taken September 2011 by Joseph Fuqua II of the Cincinnati Enquirer. After graduating from Miami University in 1995 with a business degree, Specter earned his MBA in one year from UC’s College of Business. He then enrolled at the College of Law in the fall of 1996, ultimately “drifting towards the tax planning side of things” on his way toward earning his JD in 1999. Specter worked for about two years after law school as an associate at Arthur Andersen, a global accounting firm. He then spent almost eight years with Ernst & Young, another global accounting firm, rising to the level of Senior Manager in its Transaction Advisory Services division. Today, Specter lives in Oregon, where he will be making a career out of making and selling wine. Specter worked at Ernst & Young through March 2009. It was in 2007 and 2008 when he began asking himself what he really wanted to do long-term. Around that same time, he and his wife were looking to start a family. They realized, if they wanted to do both of those things, they would need to begin sooner rather than later. 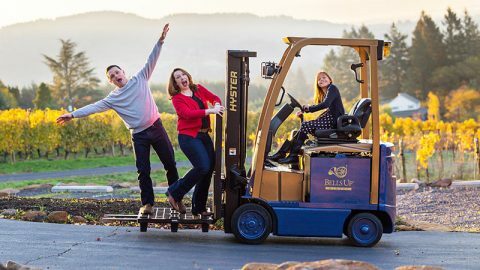 So in 2009, Specter made a bold move: he left the legal profession and joined Henke Winery in the Westwood area of Cincinnati as an assistant winemaker. 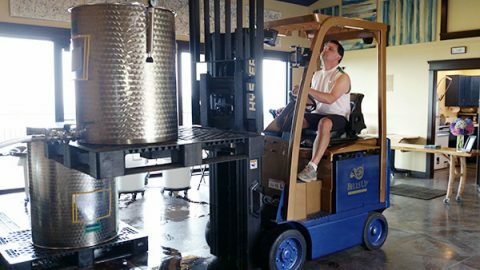 From March 2009 to June 2012, he aided Joe Henke in the full wine production process, learning the tricks of the trade that would allow him to eventually open his own winery. Eventually Specter and his wife began targeting areas for potential relocation. They visited Oregon several times and fell in love with Portland and the nearby Willamette Valley, Specter said. “We loved the people, the wine culture, the environment, and decided this is where we wanted to be,” he said. Specter grew up in Longwood, Fla., a suburb of Orlando. His family moved to Cincinnati just before his senior year of high school, and he had been in the region ever since. He and his wife lived in a small area in Clermont County called Withamsville – basically between Anderson and Amelia, Specter said. They adopted a daughter, now four, who was born just before Christmas in 2008. With the family started and a few years of professional winemaking under his belt, Specter said goodbye to many friends and family in Cincinnati. After selling their Cincinnati home last year, the Specters moved to the Willamette Valley in northwest Oregon last summer, settling into their new home. Specter might be the first College of Law graduate ever to pursue winemaking as a full-time career. He is certainly the only one from his graduating class with that distinction. But while most of his classmates are working in some legal capacity and he is now in Oregon making wine, that does not mean Specter’s legal education and experience are now irrelevant. Specter said there are types of law he deals with that he had no experience with in Cincinnati. While Specter never learned about water rights laws, for example, he nevertheless has the ability to learn and understand the issues associated with it, without having to go and hire an attorney, he said. It has been more than six months since the Specters moved cross country, almost 2500 miles from Cincinnati. He has not been back since they settled in, although at some point would like to be able to return. 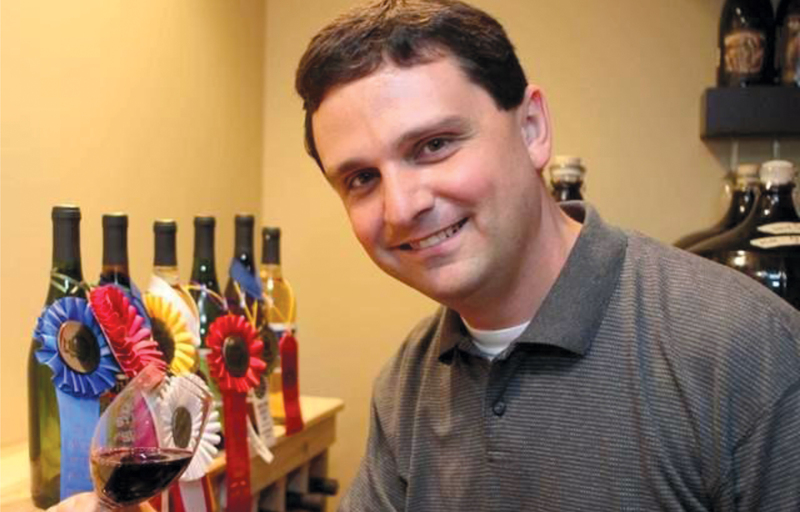 Once the winery gets going, he hopes to exhibit at the Cincinnati International Wine Festival. No matter how far away the Specters are, he has a strong support base locally. He noted that about 85 percent of the people on the contact list for the winery are from the Cincinnati area. While they left “a lot of wonderful people behind,” Specter is appreciative of the continuing support. In his free time, Specter enjoys spending time with his wife and their daughter. They watch a lot of movies, go to the zoo, and he still tries to keep track of Miami University and UC sports. Being in the “Great Northwest,” the Specters also try to get outdoors a lot. Specter had been talking about opening a winery for a long time. Finally, he is there. 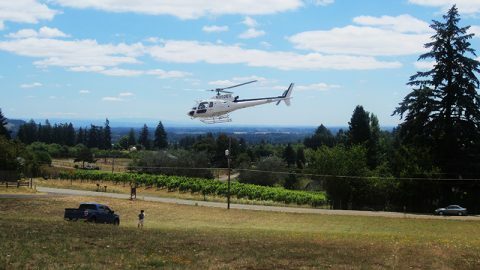 Although the name of the winery has not been formally announced, Specter said it will be called Bells Up, which is a reference to a dramatic moment in classical music where the composer instructs French horn players to lift the bells of their instruments upward and project their sound with maximum intensity. 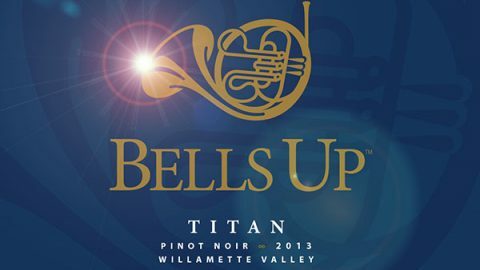 Specter, a French horn player who played in bands and symphonic groups throughout high school and college, believes that the winery represents his “Bells Up” moment. While making this bold move and career change obviously leaves some uncertainties, Specter knows he will always keep the winery small. One reason is to keep it manageable. The other reason is because it will be more intimate, and more who he is – more personable and fostering the one-on-one relationships with customers.